Tucked away in a magical canopy of lush trees sits this spectacularly preserved mid-century hideaway. Designed to capture the outdoors in nearly every room, this home epitomizes California living. The stunning living room features the best of mid-century modern design: smooth cork floors, high ceilings, oversized wood windows and a huge floor-to-ceiling glass door that opens to lush palms. Step outside and discover your own private retreat. Enjoy winter nights soaking in the hot tub and sitting by the fire pit, cool off in the outdoor shower and unwind in the adjacent sauna. A detached artist studio is perfect for work or relaxation. 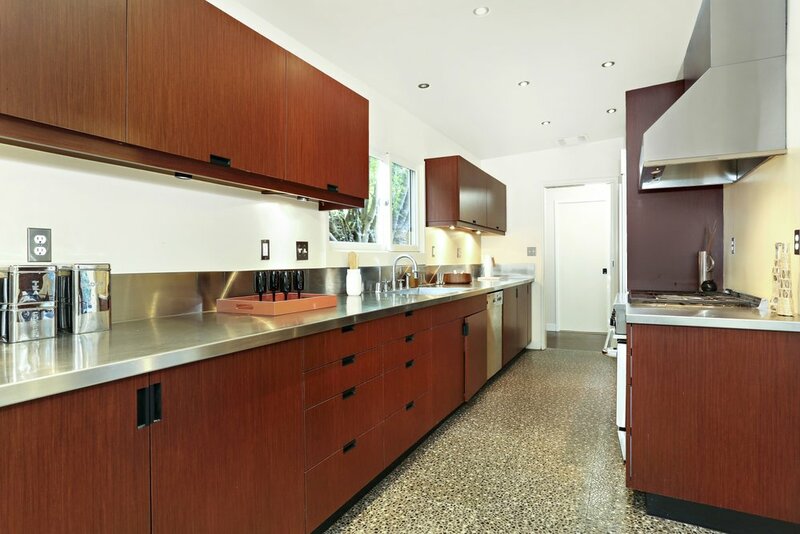 The kitchen’s long stainless steel counter tops, pebble stone floors and oversized stove are ideal for those who love to cook. Each bedroom, private and quiet, has its own access to the outside. The master bedroom opens to an incredible detached dressing room complete with oversized wardrobes and privacy curtains. Located equidistant between all the action on Figueroa and York, this home is truly one-of-a-kind.